If you want to know why American Indians have the highest rates of poverty of any racial group, why suicide is the leading cause of death among Indian men, why native women are two and a half times more likely to be raped than the national average and why gang violence affects American Indian youth more than any other group, do not look to history. 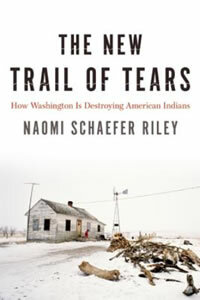 There is no doubt that white settlers devastated Indian communities in the 19th, and early 20th centuries. But it is our policies todayâ€”denying Indians ownership of their land, refusing them access to the free market and failing to provide the police and legal protections due to them as American citizensâ€”that have turned reservations into small third-world countries in the middle of the richest and freest nation on earth. The tragedy of our Indian policies demands reexamination immediatelyâ€”not only because they make the lives of millions of American citizens harder and more dangerousâ€”but also because they represent a microcosm of everything that has gone wrong with modern liberalism. They are the result of decades of politicians and bureaucrats showering a victimized people with money and cultural sensitivity instead of what they truly needâ€”the education, the legal protections and the autonomy to improve their own situation. If we are really ready to have a conversation about American Indians, it is time to stop bickering about the names of football teams and institute real reforms that will bring to an end this ongoing national shame.